Shopping for Sports: Wrestling Games? Back in prehistoric times, there was little to do other than hunt dinosaurs or invent the wheel. One evening, a caveman sat near his newly-discovered fire, snacking on a Microraptor. Spitting out one of the tiny bones, he laughed as it rolled and bounced along the ground, thoroughly entertained. Thus, the idea of Adventure Bones was conceived. Evolving throughout the ages, it is now a game enjoyed by all! 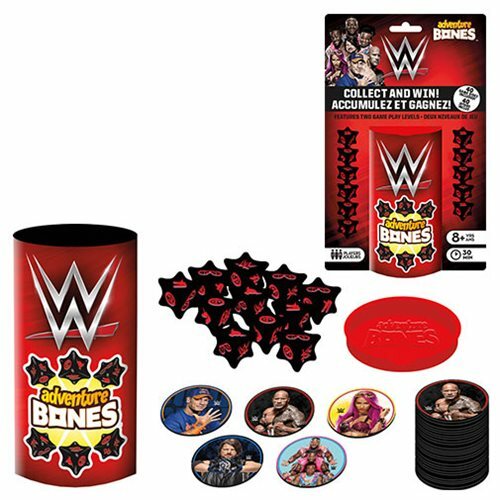 Play the WWE Adventure Bones Dice Game at your next game night! 2-8 players, Ages 8 and up.